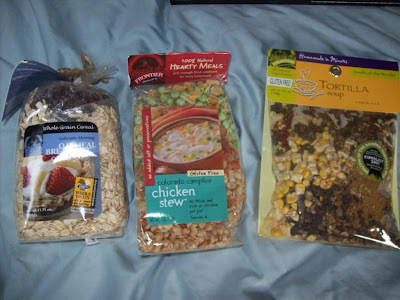 I have heard great things about these Frontier Soups so I knew that I would love to review them! They are soup mixed that are dry and you just need to add a few ingredients to them to make a fresh tasty soup. Each pack makes 8 servings and this particular soup is only 160 calories. My absolute favorite part of this company is that there is not any salt added to the soup. This one only has 10 mg of sodium per serving which is nothing. How rare to find a soup with no added sodium! This soup is a winner in my book. Also, I am a huge oatmeal lover and got to try the Colorado Morning oatmeal! Oatmeal, brown sugar and walnut streusel mixture and dried cranberries. No added salt, preservatives or MSG. I am a new, huge fan of this brand! Thanks a bunch Frontier Soups!